Worm farms. 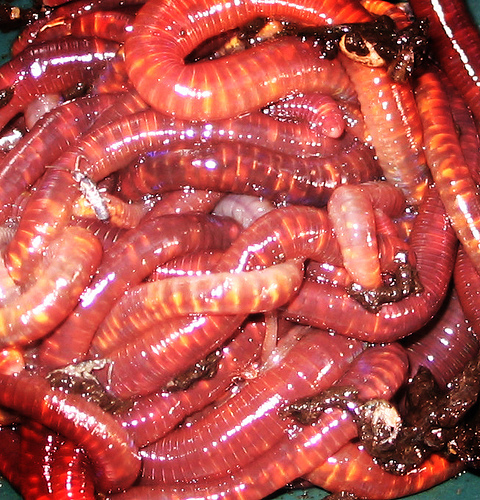 How to compost with worms. Photo courtesy of maudieshah at Flickr.com. Farming with worms is a simple way to turn food scraps into organic fertilizer. Worms are quick workers, and they don’t sleep. They work 24 hours a day, and don’t take any holidays. Worms breed faster than rabbits, plus their birth rate is boosted even further because there’s no need to kill them to harvest their work. As worms eat vegetable scraps and fruit rinds, they turn trash into soil. Their worm castings are rich in healthy bacteria, as well as worm cocoons that each contain 2-50 baby worms. 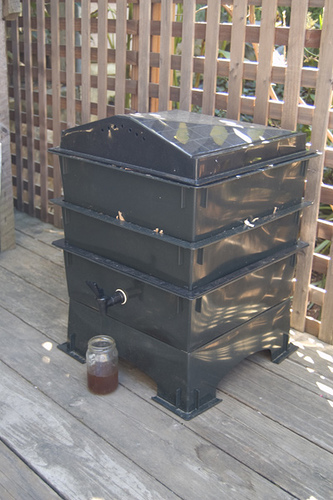 Worm castings can be harvested simply by sifting the soil from a worm bin. 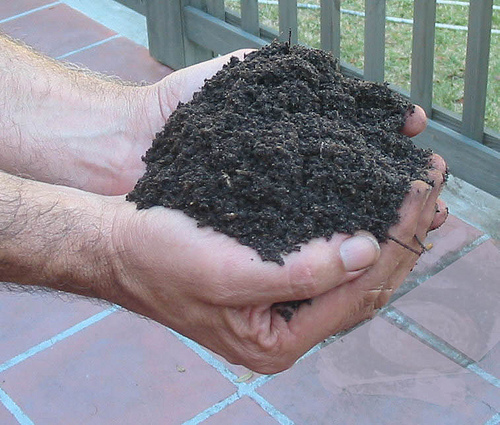 When composting with worms, you can use either a compost trench or a compost bin. Compost trenches are simply holes in the ground full of compost. These compost middens can be difficult to dig, especially if you make them deep enough to keep animals from burrowing into the trash. To control odor, compost trenches should be dug at least 6 feet into the ground. This is the perfect depth for Nightcrawler worms (which are also known as Common European Earthworms, Tiger Worms, or Angleworms). A hole that’s one-foot in diameter will hold about 5 gallons of compost, and a 12 ounce tub of earthworms will be able to process that compost in 1-2 months. A shallow trench can also be used within a fenced garden or any area protected from rats, badgers, and other scavengers. Dig the trench 6-8 inches deep, and then add Red Wiggler worms. These worms work close to the surface and will generally stick to the area that you’ve dug up for them, because the loose turned soil is easy to tunnel through. Digging compost trenches is hard work, and compost bins are an easier alternative. Instead of digging a new hole every time you have compost, you can simply lift the lid and add compost to your vermicomposting bin. Worm farms will not only protect your worms from predators (such as birds and snakes) but they will also keep the worms from wandering away into your neighbor’s yard. Worm bins come in many different sizes and designs; you can make one yourself, or buy one and protect your thumbs from stray hammer blows. When choosing a bin, the size you pick often depends on the number of people that live at your house. An average person produces about 2 square foot of organic waste per week, so your worm bin should have at least that much space per person living with you. Choose a bin with enough capacity to meet your peak needs, and maybe a little bit more. For example, if you have 2 people living in an apartment, an ideal size for a worm bin would be 4 or 5 square feet. If you often host relatives at your house for Thanksgiving dinner, there’s no need to count them towards your total, but if you have guests over for dinner every wednesday, you may want to get a slightly larger worm bin. After you’ve picked out a worm bin, it’s important to put a biodegradeable lining into it. Worms don’t like the feel of plastic, wood, or metal against their skin, and extreme temperatures can stress them out. So, you should insulate your worm bin with shredded paper, strips of cardboard, peat moss, or coconut fiber. These materials will soak up water and help maintain a steady humidity level. They are also rich in carbon, while most food scraps have high levels of nitrogen. When worms need to snack on some carbon rich materials, they will nibble at the lining of the worm bin and choose a diet that meets their needs. 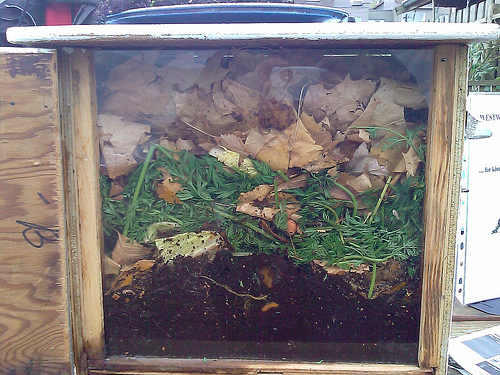 It’s important to add a thick layer of soil to your worm composting bin along with food scraps. Worms need soil in the same way that fish need water. They need it to ‘swim’ through, and it makes them feel comfortable. Soil will help buffer the acidity of any organic waste that you add, and it also provides a pathway for worms to burrow through. Soil also contains healthy organisms that will help the worms digest food scraps. Photo courtesy of mdelemos at Flickr.com. Photo courtesy of www.ecoyardfarming.com at Flickr.com. Healthy soil is full of worm castings. That’s the polite euphemism for worm poop – it sounds better than worm droppings or worm crap. No matter what you call this fertilizer, worm castings are a great natural way to boost the nutrient capacity of soil. Unlike cow patties or other excrement, worm castings are odor free. They’ve been reprocessed by a worms stomach multiple times, which means they’ve reached a stable, neutral state. Worms have done all the hard work of breaking down nutrients into their base components – these are simple building blocks that plants can work with easily. Worm castings also contain several million helpful bacterium per gram. These helpful bacteria come from inside the stomach of worms. Just like the human body uses symbiotic organisms to digest food, worms also rely on the help of microscopic helpers. These bacteria remain active in vermicastings, and they will help make nutrients available to plants. Many soil bacteria help plants by converting nitrogen compounds into natural fertilizer underground. The enzymes produced by these bacteria also help break up soil debris, such as dead roots, wood chips, and clumps of earth that roots would otherwise have to waste time growing around. Worm castings have 10 to 20 times the microbial activity of topsoil where worms aren’t present. Also, healthy soil bacteria allow plants to get more nutrients from the soil. When a plant drops a leaf onto the ground, it can take a long time for the nutrients in that leaf to break down into the soil. Soil bacteria accelerate this natural process by increasing the speed of nutrient cycling. Instead of waiting several years for the carbon, potassium, and nitrogen, plants are able to use and re-use the nutrients at a faster rate. This allows plants to grow at a much faster rate than they would otherwise. As plants grow, they go through cycles of respiration and chemical synthesis. Each step of this process requires energy as the plants produce chemicals that they need, and that energy is not available for other life processes. A tree or flower that has to work hard to extract nutrients from the soil is more vulnerable to insect damage or disease. Active soil bacteria help make plants healthier by closing the loop and assisting in the synthesis of many amino acids, micro nutrients, and chemical precursors. They work like a surgical nurse in the hospital, passing tools along as they’re needed. Worm castings are also great for soil structure because they retain moisture very well. Worm castings can hold 9 times their weight in moisture. This water capacity is similar to peat moss, mulch, and coconut fiber. That’s important because dry soil can harm plants by sucking the moisture out of their roots. If your soil is too dry, try mixing in some vermi compost. Since worm castings retain moisture, they can help your plants survive even in drought like conditions. When used as a soil amendment, worm castings reduce the danger of cracked foundations, erosion, and subsidence. Photo courtesy of Zombizi at Flickr.com.